Friday started with a 42.5km team time trial in the evening. Our girls raced a steady TTT, but was not able to get the speed high enough from start. As the girls got into the race they were able to speed up, but at this level it was a little too late to achieve the top ten result they are capable of. The race was won by Boels Dolmans ahead of Cervelo Bigla and Rabobank Liv. A good pointer and also opportunity for teams to make adjustments ahead of the World Championships in Qatar. Sunday offered a road race suited for the early birds as the race started 8.15 in the morning. The whole race was broadcasted live on TV. During the race there were several breakaways, but it all got reeled in by the peloton. On the longer lap midrace, a group of nine escaped on one of the gravel sections, unfortunately without our girls. With 20km to go the gap was down to 40seconds, at that point another two riders escaped the peloton trying to bridge up to the front. The group of nine managed to stay away to fight for the win with Emilia Fahlin (Ale-Cipollini) taking a popular win in front of home crowds. Lotta Lepistö (Cervelo-Bigla) finished in second and Chantal Blaak (Boels Dolmans) in third. Our girls finished safely in the bunch. Our team this weekend: Emilie Moberg, Tone Hatteland Lima, Cecilie Gotaas Johnsen, Lauren Kitchen, Julie Leth & Thea Thorsen. 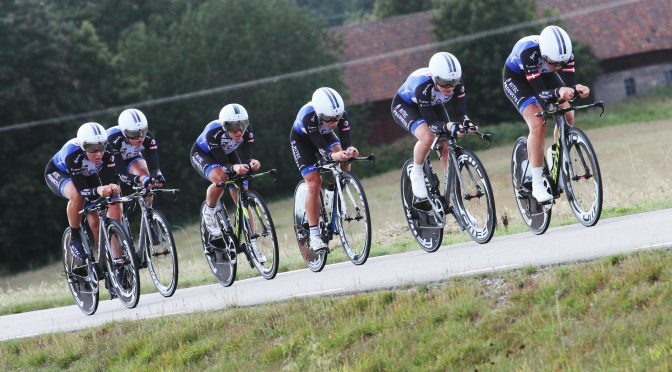 Next up for the team is Holland Ladies Tour 30th of August – 04th of September.